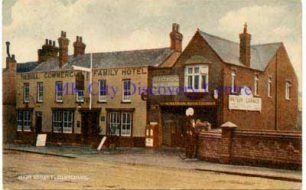 Colour postcard showing an external view of Ye Old Swan, Newport Road, Woughton. Undated. Black and white postcard of a photograph showing the view down Denbigh Road, Bletchley. A small child is stood on a path to the left and a car can be seen in the distance coming towards the camera. Undated. Colour postcard of an external view of The Bull Hotel and Watson's Garage, High Street, Bletchley (now Fenny Stratford). Undated. Items relating to the general improvement area in New Bradwell, plus railway cottages meetings and employment and leisure history. Completed counterpart agreement between Fred Lines of Lines & Son, 77 Newport Road, and The Imperial Tobacco Company (of Great Britain and Ireland) Limited for admission into customers' bonus scheme. Includes cheque for £9 18s. Small donations not large enough for their own collection, or without a single identifiable creator. Held at Newport Road Recreation Ground, Whit Monday, 6 June 1949. Postcard of a photograph of St. Mary's Chapel on the site of the former Bradwell Abbey, Milton Keynes. Undated, picture suggests c1955. Postcard of a photograph of St. Peter and St. Paul Church, Olney. Undated, picture suggests c1960-1970. 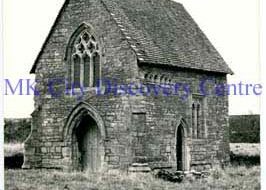 22 page photograph album of black and white photographic prints of St. Peters Church / Stanton Low, Stantonbury.